With Dynamic Targeting® IGRT, clinicians can deliver more tightly focused and precise beams to cancerous tumors. What is Dynamic Targeting® IGRT? Currently, photons (X-rays) are used to deliver IGRT. The radiation is generated by a machine called a medical linear accelerator. This machine stands approximately nine feet tall, is nearly 15 feet long and can be rotated around the patient with great precision. Operationally, microwave energy, similar to that used in satellite television transmission, is used to accelerate electrons to early the speed of light. As they reach maximum speed they collide with a tungsten target which, in turn, releases photons, or X-rays. The radiation beams converge to deliver high doses directly to the targeted tumor while avoiding the sensitive spinal cord. 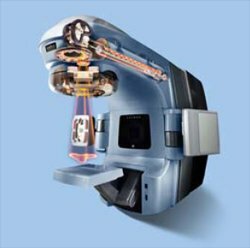 Varian’s On-Board Imager® kV imaging system gathers images, pinpointing the exact tumor location just prior to treatment. a radiation therapist, who sets the patient up for treatment and runs the equipment that delivers the radiation. Medicare does provide additional reimbursement for the various steps involved in delivering IGRT, whether the treatment occurs in a hospital outpatient environment or in a freestanding outpatient clinic. 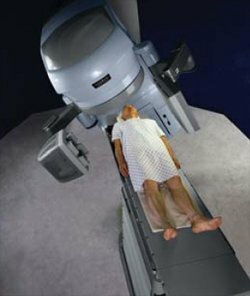 Many health insurance policies cover charges for radiation therapy. It’s a good idea to talk with your insurer or with your doctor’s office staff or the hospital business office about your policy and how expected costs will be paid. 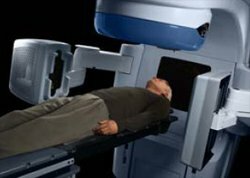 A patient is positioned for radiation therapy treatment using Varian’s On-Board Imager® kV imaging system. 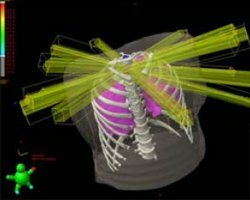 Finally, in “cone-beam CT” mode, the On-Board Imager generates three-dimensional images that show soft-tissue structures (organs such as the prostate, or the tumors directly), and make it possible to check for changes in tumor size or position. Also, because the Varian system is entirely integrated, information can be moved electronically and seamlessly from one part of the process to the next, improving safety and expediting the treatment process.